12,825 pages of documents, text, newspaper articles, and photos covering the Titanic disaste. Period original source material from the National Archives, The Library of Congress, and the British National Archives. its maiden voyage, claiming the lives of 1,517 persons. Many of those who perished on the ship came from prominent American, British, and European families. Among the dead were the noted British journalist William Thomas Stead and heirs to the Straus and Astor fortunes. The glamour associated with the ship, its maiden voyage, and its notable passengers magnified the tragedy of its sinking in the popular mind. Legends arose almost immediately around the night's events, those who had died, and those who had survived. Heroes and heroines, such as "the unsinkable Molly Brown", were identified and celebrated by the press. Some individuals were crowned as villains, such as the captain of the SS Californian, Stanley Lord and White Star Line Managing Director J Bruce Ismay. The disaster and the mythology of the Titanic continue to fascinate people many years after the event. The White Star Line signed the order to proceed with construction of the Titanic on April 30, 1907. Construction began at the Harland and Wolff shipyard in Belfast, Ireland, and was completed on April 2, 1912. Most of the crew for the maiden voyage was hired on Saturday, April 6, 1912. The ship departed from Southampton, England on its first and final journey at noon on Wednesday, April 10, 1912. The ship stopped at Cherbourg, France, where it picked up additional passengers, including first class passengers Margaret (Mrs. J.J.) Brown, the Astors and the Wideners. It stopped again at Queensland, Ireland, to pick up more passengers. At 1:30 PM, Friday, April 12, it left Ireland for the open seas on its maiden voyage to the United States. It had 338 first class passengers, 279 second class passengers, 712 third class passengers, and a crew of 908. The Titanic hit the fatal iceberg at 11:40 PM Sunday night, April 14. Distress calls were sent from the Titanic, but help arrived too late. At 2:20 AM Monday, April 15, the Titanic went to the bottom in 13,000 feet of ocean. Finally, help did arrive, and between 4:10 and 8:10 AM, the Cunard Line's Carpathia rescued 706 Titanic survivors. The Carpathia arrived in New York City at 9:00 PM on Thursday, April 18. Two days after the sinking, ships were dispatched back to the area to recover bodies. Eventually some 330 bodies were recovered. Some of the bodies were taken to North America, while others were buried at sea. In 1985, Dr. Robert Ballard, of the Woods Hole Oceanographic Institute, led a team that discovered the final resting place of the Titanic and began periodic visits to the wreckage. 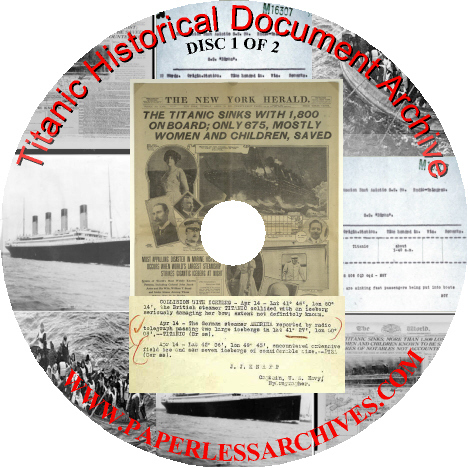 8,825 pages of archival copies of documents related to all aspects of the Titanic. Series of information includes: List of passengers boarding at Queenstown, boarding at Southampton, lists of crew and passengers, lists of passengers lost, Titanic's registration documents, British Foreign Office correspondences dealing with the disaster, British Board of Trade Marine Department correspondences and memos, Transcripts of the 1912 Subcommittee of the Committee on Commerce United States Senate Hearing, Transcripts of the 1912 proceedings of the Court of Enquiry ordered by the British Board of Trade, Early Titanic films documents, Diagrams and memos about lifeboat arms proposed for the Olympic and Titanic, Information concerning the manning of Titanic Lifeboats, Bulkheads Committee and Watertight Compartments Committee Wreck Investigation correspondences and papers, inquiries from the House of Commons, and Engineer and Surveyor inspection reports, correspondences, memorandums, and diagrams. Among the highlights are: A List of passengers boarding the Titanic at Queenstown, most of these passengers are poor Irish emigrants en route to America, traveling as third class passengers. List of passengers boarding at Southampton, this includes many notable names, the Countess of Rothes, Benjamin Guggenheim, the American mining millionaire, J Bruce Ismay, and Colonel Gracie, whose book "The Truth About the Titanic" was published in 1913. Lists of crew and passengers, this file includes a list of crew leaving Belfast on 6 April 1912, bearing the signatures and rates of pay of individuals. Lost of crew by department and passengers by class lost and saved, some listings give addresses. 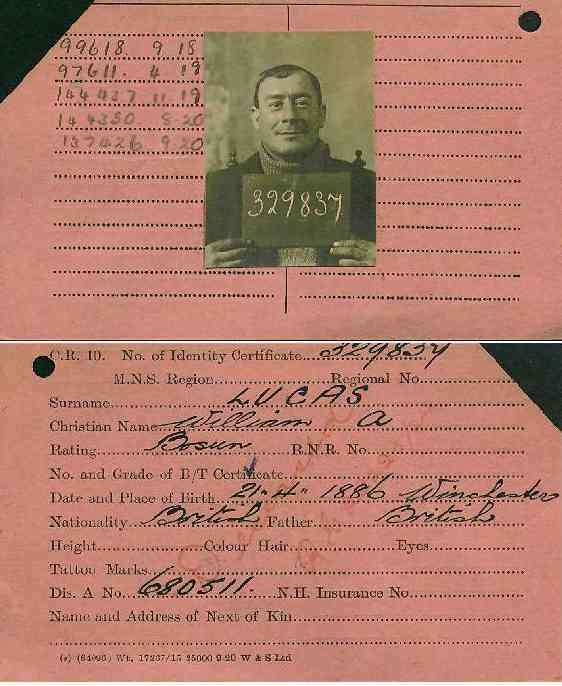 Material from the Registrar General of Shipping and Seamen covering Titanic surviving crew, showing photographs, individual's name, date and place of birth, and rating at the time the entry was made. Some give other details such as tattoo marks. Seventy-three of the 211 Titanic crew members who survived the Titanic disaster have registration information include in this file, including Frederick Fleet, the lookout man who first saw the iceberg, Master of the SS Californian Stanley Lord, the SS Californian was identified in inquests as the "mystery ship," Second Officer Charles Lightoller, and Fifth Officer Harold Lowe. Correspondence dealing with the original plans of the Titanic, showing the ship was originally to be fitted with 32 boats. This would have given capacity for over 2,000 people, significantly greater than the 1,178 that were ultimately provided for. 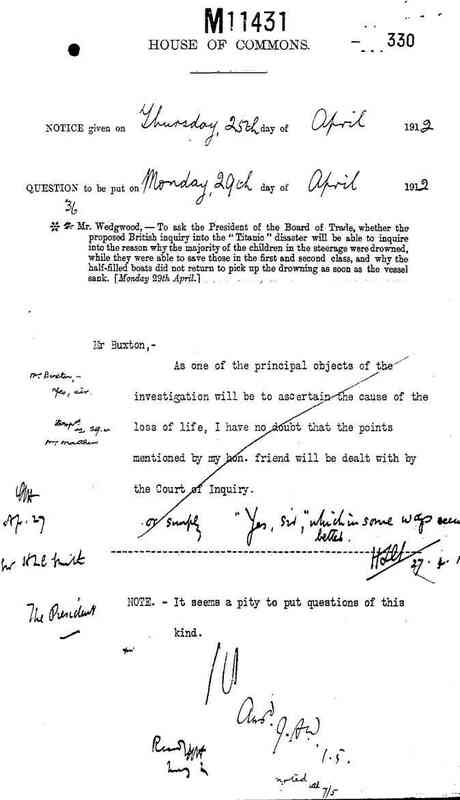 Correspondences showing the British Government was opposed to the United States holding an inquiry into the Titanic disaster. Documents dealing with the efforts to identify the mystery ship, seen from the sinking Titanic and by the SS Mount Temple. An account of a letter written by the SS Californian's carpenter saying that the "Californian did not render help to Titanic although distress signals were observed." House of Commons statements by Horace Bottomley MP, on lifeboats and the question, "How far the principal owner [Bruce Ismay] of the vessel should have precedence over a humble emigrant who has paid his fare?" Investigation found that over 500 passengers, including women and children, were still on board when Ismay left the Titanic in a lifeboat. A letter from Stanley Lord, captain of the SS Californian, to the Board of Trade complaining of the public odium he is suffering and pleading that "something be done to put my conduct on the night in question in a more favorable light to my employers and the general public" Wireless messages passing between various ships in the North Atlantic in mid April 1912. Copies of telegrams sent to the SS Birma by the Titanic. Information about ice warnings. A handwritten account by Titanic first class passenger survivor Alfred Omont of events before and after the iceberg crash. Transcript of an account by Arthur Rostron, the captain of the SS Carpathia, of the ship's high-speed trip, navigating through icebergs, to reach the Titanic survivors. 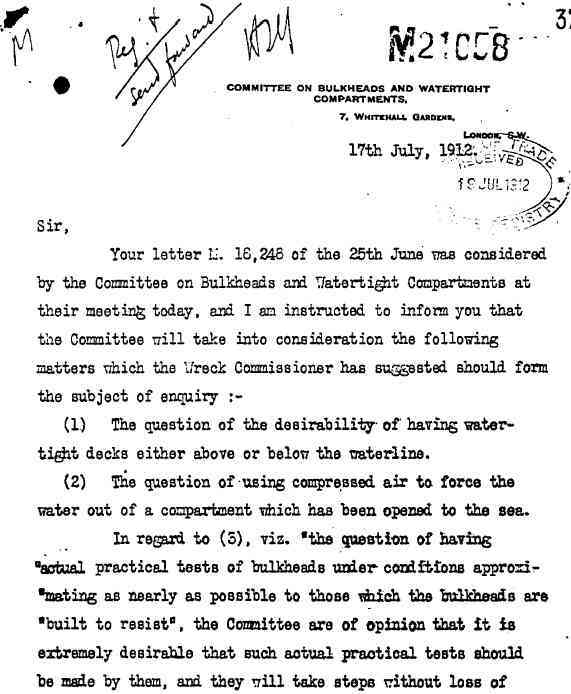 A letter filed by Sir Alfred Chalmers, the board of Trade member responsible for lifeboat requirements for passenger ships, arguing that more lifeboats would not have saved more lives on the Titanic. Documents concerning the British International Pictures production "Atlantic" of 1929, which was based on the sinking of the Titanic. Germany was quick to use the film as anti-British propaganda, claiming that if the ship had been German, the disaster would never have happened. 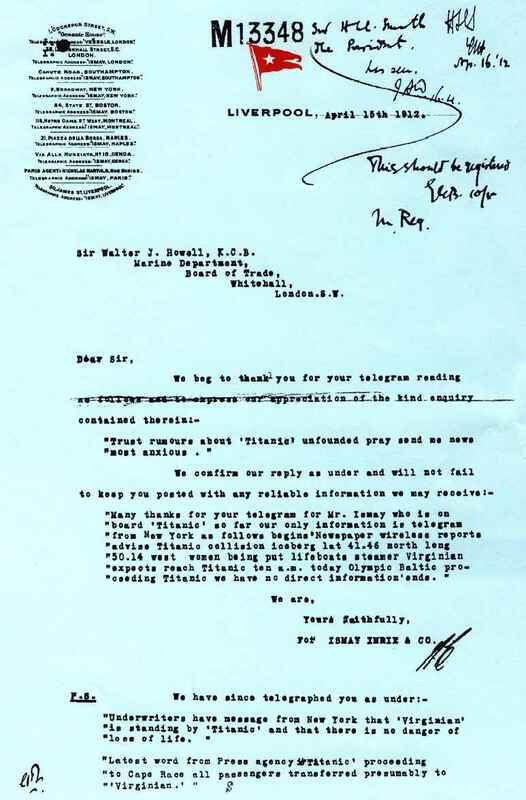 Documents show the efforts of the British Chamber of Shipping to stop Alfred Hitchcock from making a film about the Titanic disaster. Diagrams of Titanic's bulkheads. Chart of ice reported near the Titanic. Chart of ships' positions near the Titanic. 1226 pages of computer text of testimony given at the hearings before a Subcommittee of the Committee on Commerce, United States Senate. The Titanic hearings were conducted by a special subcommittee of the Senate Commerce Committee and chaired by Senator William A. Smith, a Republican from Missouri. The hearings began on April 19, 1912, in New York City. The Senate inquiry is particularly useful because it was the most immediate. The inquiry began at the Waldorf-Astoria Hotel in New York the day after the survivors landed. James Cameron used the Senate transcripts extensively in researching his Oscar-winning movie. "The Senate records, for example, provide the exact words spoken by the bridge officers in the moments leading up to the collision," Mr. Cameron has written. "Those scenes in my film are scripted and staged precisely as the event was described by witnesses." A week after the proceedings began, the hearings were moved to the new caucus room of the Russell Senate Office Building in Washington, D.C. They were the first hearings to be held in that room. A total of 82 witnesses testified about ice warnings that were ignored, the inadequate number of lifeboats, the ship's speed, the failure of nearby ships to respond to the Titanic's distress calls, and the treatment of passengers of different classes. 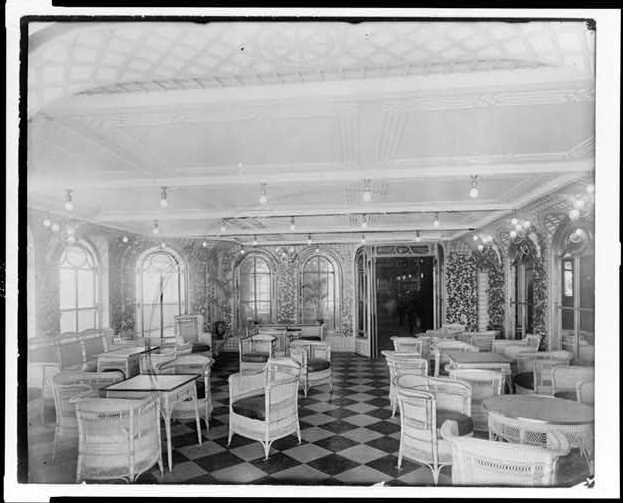 The hearings concluded on May 28, 1912, when Senator Smith visited the Titanic's sister ship, Olympic, at port in New York, to interview some of its crew. When the Titanic sank, the Olympic was about 500 miles away. 1446 pages of computer text of testimony before the Court of Enquiry and the Court's final report. Within two weeks after the sinking of the Titanic, the British Board of Trade established a Commission of Enquiry, chaired by High Court Judge Lord Mersey. The hearings were opened in the Wreck Commissioner's Court, Royal Scottish Drill Hall, Buckingham Gate, Westminster, on 2nd May, 1912. The British Inquiry cleared Captain Smith and the White Star Line of any negligence in the loss of the Titanic. The conference confronted issues such as subdivision of ships, lifeboat provisions, wireless telegraphy, the reduction of speed in the vicinity of ice, and the use of searchlights. 136 Titanic related photographs. Subject matters include: Titanic under construction, interior of the Titanic, Titanic survivors in lifeboats, survivors onboard the Carpathia, icebergs near the site of the Titanic sinking. The photographs of 72 members of Titanic's crew from registration cards maintained by the Registrar General of Shipping and Seamen. Arrival, for the R.M.S. Carpathia arriving in New York on April 18, 1912, carrying Titanic survivors. destination, physical description, and place of birth. 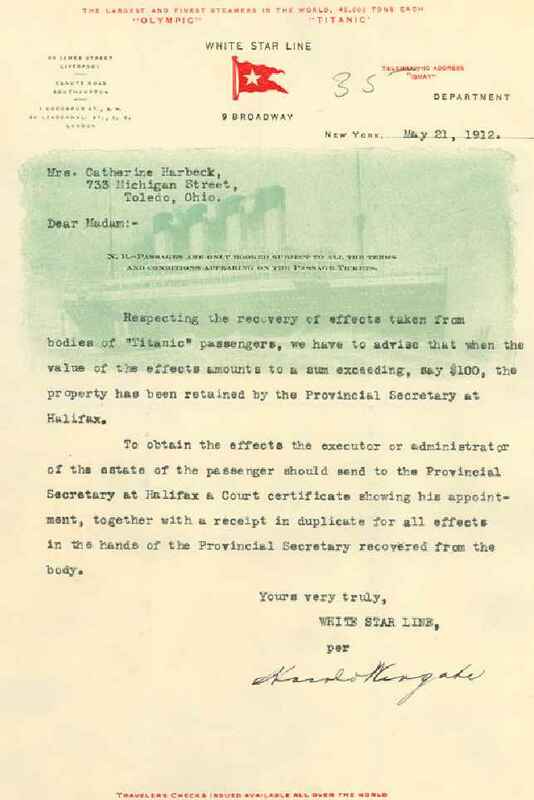 Nova Scotia Provincial Secretary's Office Disposition of Bodies ex Titanic Recovered up to May 13, 1912. The White Star line charted ships in Halifax to recover Titanic passenger and crew remains that were at sea. 328 bodies of Titanic victims were found at sea and were either buried at sea or brought back to Halifax, the capital of the Canadian province Nova Scotia. There, the Provincial Secretary's Office of Nova Scotia was in charge of administrating the handling of the remains. The Office produced the report, "Disposition of Bodies ex Titanic Recovered up to May 13, 1912." It contains two sections, "List of Bodies Identified and Disposition of Same," and "List of Bodies Unidentified and Disposition of Same." The information recorded in the report includes the descents' name if known, distinguishing physical features and notations regarding clothing and personal effects found on the body, and the final disposition of the remains. The list includes body number 122 J. J. Astor. Halifax Medical examiner files. 93 pages of Medical Examiner, City of Halifax and Town of Dartmouth documents concerning remains and property of several recovered Titanic bodies. Lawrence Beesley was a second class passenger aboard the Titanic. This account was written two months after the sinking. CH Lightoller was the most senior surviving officer aboard the Titanic. Lightoller chronicles his life at sea from being an apprentice on a sailing ship at age thirteen to commanding a destroyer in World War I. In addition to his history with the Titanic, Lightoller tells of his experiences with hurricanes, fires, other shipwrecks, and being a gold prospector in the Klondike. One of the first "instant books" sold door-to-door and through newspaper ads in the United States, dealing with the Titanic disaster. Information in the book was quickly compiled from newspaper reporting. Focusing more on sensationalism than accuracy, the book itself documents public reaction to the sinking of the Titanic. Published in 1924, it includes two often quoted essays written in 1912 about the Titanic disaster, "Some Reflections, Seamanlike and Otherwise, on the Loss of the Titanic," and "Certain Aspects of the Admiralty Inquiry into the Loss of the Titanic." A science fiction novel set in the year 2000, written in 1887 by millionaire inventor and Titanic victim JJ Astor. Topics covered include air travel, space travel, anti-gravity devices, television, a world-wide telephone network, and solar energy.